Jupiter Jones (Mila Kunis) is just your average, everyday Russian immigrant trying to make a life for herself in America. She cleans apartments alongside her other family members, admires the jewelery and clothing of the people she works for, and plans to sell her eggs so that she can buy a telescope like the one her murdered English father (James D'Arcy) once owned. Unbeknownst to Jupiter, she is the heir to an intergalactic fortune, something which puts her squarely in the middle of a centuries-old rivalry between Balem (Eddie Redmayne), Titus (Douglas Booth) and Kalique (Tuppence Middleton), three siblings from the Abraxis family, all of whom want to kidnap or kill Jupiter to advance their own agendas. Pursued by various alien bounty hunters, Jupiter falls under the protection of Caine Wise (Channing Tatum), a disgraced space cop who also happens to be half-wolf. Together, Jupiter and Caine try to navigate the complex political maneuverings of the Abraxis, as well as the myriad explosions that keep interrupting their halting romance. Considering how many crazy concepts writer-directors Andy and Lana Wachowski throw around in Jupiter Ascending, you'd think that it would have a bit more energy. After all, this is a story which gives us genetic reincarnation - the idea that if someone is born with the exact same genome sequence as someone who died thousands of years ago, they can inherit the property and title of the dead person - as opposed to boring old spiritual reincarnation, genetically-spliced superhumans, and a trio of nearly immortal siblings vying for the rights to harvest the Earth for nutrients. You know you're in a pretty weird place when the image of Channing Tatum with pointy ears that make him look like Mr. Tumnus after he's spent a lot of time in the gym is pretty low down on the list of gonzo stuff in a movie. In spite of all of its visual invention and conceptual boldness, Jupiter Ascending is only fitfully exciting, in large part because its ideas are almost solely relayed through long stretches of exposition, often delivered by characters who are more interesting for what they are than because of what they do. For example, Jupiter (or Jupe, as she asks to be called with an air of nonchalance that is hilariously out of place) learns about the intergalactic sibling rivalry and her place within it from Sean Bean, who plays a half-human, half-bee hybrid named Stinger. It's a scene which should be exciting, both because it's a moment when the protagonist discovers that everything she knows about the world is a lie, and because she's talking to someone who's a bee. Instead, it's really flat, with no sense that the truths Stinger is imparting are actually significant. Rather than being the fulcrum upon which Jupiter's entire life hinges, it's just a slightly dull scene of Sean Bean talking in a dilapidated house. It does, however, feature the line "bees don't lie," one of a handful of snatches of dialogue (another great one: "Your Majesty, I have more in common with a dog than I do with you." "I love dogs, I've always loved dogs.") which will make the film great riffing fodder for the likes of The Flop House and How Did This Get Made? The big difference between the two scenes is that Morpheus' exposition is augmented with images of a devastated Earth, and the sublimely simple way of explaining the machines' plan by equating humanity to batteries. Jupiter Ascending, meanwhile, gets bogged down in telling when it should show, and it doesn't even make the telling all that fun. The locations around its characters are often opulent or dazzling, showing off some very impressive production design, but it's a real problem when the tables and chairs are more interesting than the people sat at them. The film is at its best when it delves into the relationship between the Abraxis siblings. Those scenes also tend to be heavy on exposition, particularly once each of them meets Jupiter and has to spend several minutes explaining some new concept to her, but Booth and Middleton give performances which suggest a complexity that isn't apparent in their dialogue. They come across as master politicians and manipulators who have survived so long because they're cunning, not merely because technology has extended their lives. 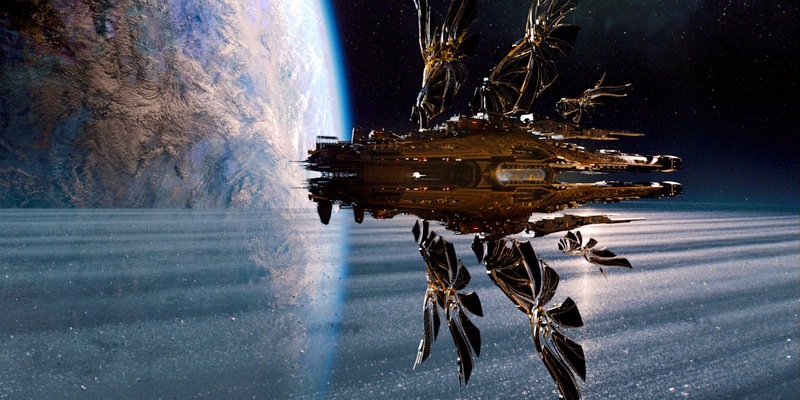 It's in those moments, and in the way that the film engages with the actual industry of planet-harvesting that makes up the Abraxis' business model, that Jupiter Ascending most recalls Frank Herbert's Dune (a connection that The Wachowskis seem to hint at with the name "Abraxis," which is pretty close to "Arrakis," the name of the planet at the centre of Herbert's novel), which is to say that it works as a slightly stuffy space opera. While Booth and Middleton give performances that anchor the film with a dynamic that sort of works, Eddie Redmayne comes along every so often to cut it loose again. Adopting a delivery that seems to have been borrowed from the Pixies, Redmayne alternates between whispering his lines like a sinister librarian and bellowing them like a town cryer. It's such a bizarre, misjudged and hilarious choice that I couldn't help wondering if The Wachowskis had accidentally included rehearsal footage of Redmayne trying something out. If enough people had actually gone to see Jupiter Ascending, then Balem Abraxis would follow in the footsteps of Borat and Bane as go-to impressions for comedians the world over. Jupiter Ascending is maddening. It's beautifully designed, has imagination to spare, and at least a little bit of subtextual heft in its vision of a universe in which the rich literally depend on the deaths of the poor to survive, but it's fatally bland. Most of the characters are forgettable, and the one that is memorable is so for all the wrong reasons, the story floats by on fairytale logic as a sci-fi spin on Cinderella but without any real sense of magic or wonder, and even the action sequences feel sterile because they involve characters that it's hard to care about. Considering what a disaster it has been at the box office, I can't see The Wachowskis being given a budget this big again, and I really wanted them to go out with another Cloud Atlas: an ambitious and beautiful film with something to say. Jupiter Ascending might be ambitious and occasionally beautiful, but it's also empty-headed and mute.